Vitoria's ingenious blood donation shirt campaign. 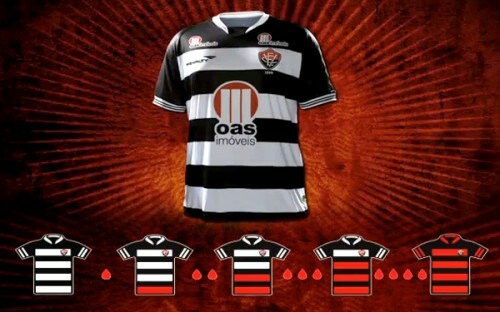 Simple cause-related shirt deal by Brazilian club, Vitoria. The side normally play in red and black hoops but have ‘drained’ the red for the start of the season. Hoops will be ‘filled’ as fans donate blood. Raising awareness and calling for action in one hit. From Who Ate All The Pies.